Little Shrub-The Tallest Tree, Little Shrub is a very small tree in a very tall forest. In spite of this, he feels so much taller inside then he actually is. He dreams of nesting birds safely raising their young in his leafy abundant branches-far above the forest floor. Sadly, Little Shrub isn't growing. His deep longing to be taller still won't leave him. "I know I'm taller than this," said Little Shrub, "I just need to find out how to get my branches to believe what my heart says is true." With those words, he begins his journey to find the secret to being taller. Little Shrub discovers this: he had the answer all along This book will kindle faith, in readers both young and old. 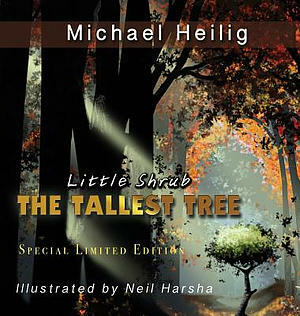 Little Shrub-The Tallest Tree: Special Limited Edition Hardback by Heilig, Michael F. was published by Migmir Company USA, LLC in December 2017. The ISBN for Little Shrub-The Tallest Tree: Special Limited Edition Hardback is 9780997347753. Be the first to review Little Shrub-The Tallest Tree: Special Limited Edition Hardback! Got a question? No problem! Just click here to ask us about Little Shrub-The Tallest Tree: Special Limited Edition Hardback. Author / Artist Heilig, Michael F.